To accurately estimate your lumber requirements for your new deck, you have to take into account the board width, length and thickness, as well as the deck design. Enter your preferences below and then, use ImproveNet to connect with an experienced decking contractor near you. Board Size 2 in. x 2 in. x 8 ft. 2 in. x 4 in. x 8 ft. 2 in. x 4 in. x 10 ft. 2 in. x 4 in. x 12 ft. 2 in. x 4 in. x 16 ft. 2 in. x 6 in. x 8 ft. 2 in. x 6 in. x 10 ft. 2 in. x 6 in. x 12 ft. 2 in. x 6 in. x 16 ft. 2 in. x 8 in. x 8 ft. 2 in. x 8 in. x 10 ft. 2 in. x 8 in. x 12 ft. 2 in. x 8 in. x 16 ft. 2 in. x 10 in. x 8 ft. 2 in. x 10 in. x 10 ft. 2 in. x 10 in. x 12 ft. 2 in. x 10 in. x 16 ft. 2 in. x 12 in. x 8 ft. 2 in. x 12 in. x 10 ft. 2 in. x 12 in. x 12 ft. 2 in. x 12 in. x 16 ft. Expansion Gap 3/16 in. 1/4 in. 5/16 in. 7/16 in. 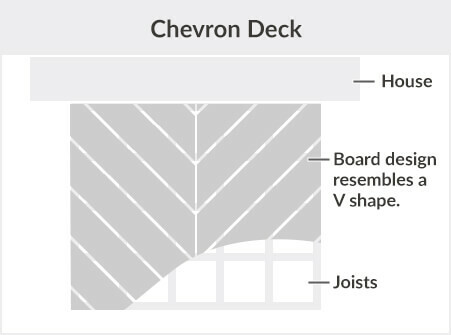 Tip: Deck boards need a gap between each individual one, along the length and at their ends. This allows water to drain. Tip: there are different ways to configure your deck boards. This calculator includes horizontal and diagonal decking. Chevron and picture frame designs require more materials and cost. 0 boards 2 in. x 4 in. x 8 ft.
Get accurate deck quotes. It's free! 1. Extension of Your Home: A new deck expands your usable square footage. Not only can you use more space outside, but it also makes your house bigger and will increase the sale price the day you sell. 2. Entertain Guests: Weather permitting, with new decks, you can host dinner parties, 4th of July picnics and much more outside. 3. Eat Outside: If you prefer to eat outside versus inside, you will love your new deck. It’s like a standing reservation outdoors. 4. Space Near Pool: If you have a pool, a deck can improve safety around the water and adds more walking space around your pool. 5. Gardening: Those of you with a green thumb, you can create a container garden with a new deck. (DSA) Deck Surface Area (in square feet) = Deck Length (feet) X Deck Width (feet). You need to calculate lineal feet to determine how much material you’ll need. Width of Boards (feet): Necessary to determine lineal feet. Lineal Feet = Deck Surface Area / Width of Boards. Lineal feet tell you how many boards you’ll need. (EG) Expansion Gaps: Small gaps between each board to let water drain. Expansion gaps exist along the lengths and widths of the boards. (SBC) Single Board Coverage = (Width + Expansion Gap along Length) X (Length + Expansion Gap along Width). To account for waste, multiple your Single Board Coverage by 1.1 (10%) or 1.15 (15%). 1. Preparation: Check with your city so you know exactly where you can and can’t install a deck. Also, see if you have to pull permits. Then, call 811 so they can mark your property and utility lines. 2. 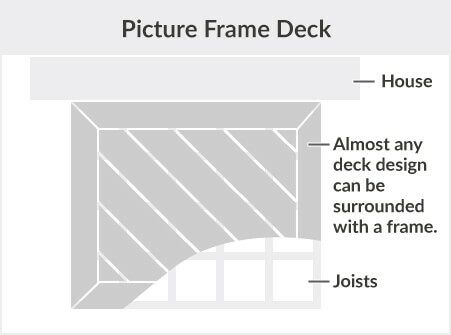 Sketch the Deck: Lay out your deck with stakes at each corner and string in between. Then, use a long tape measure to determine the total length and width of your deck (enter into calculator). From here, you should be able to determine your deck surface area (Length X Width). 3. 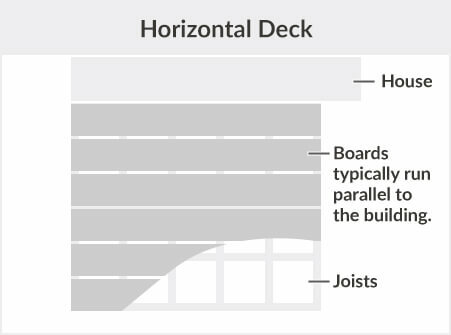 Deck Design: You have a few options, such as 90 degrees (horizontal), 45 degrees (diagonal), raised, platform, straight and plenty others. Determine what you want (explanations below) and adjust your sketch. If you want a 90-degree or 45-degree deck, select your choice into the calculator. 4. Board Size: Determine your desired board size. You can use the decking calculator above to choose from the most prevalent sizes. 5. Expansion Gap: These are small gaps between each board. You need these gaps to drain water. Determine your desired expansion gap and enter into deck calculator above. 6. Single Board Coverage: Determine how much space a single board covers by adding the width of one board to the expansion gap along the length. Then, add the length of one board to the expansion gap along the width. Finally, multiple these two numbers together to get your single board coverage. 7. Waste: For a horizontal design, add 10% to account for waste or mistakes. To do this, multiply your single board coverage by 1.1. For diagonal designs, add 15% by multiplying single board coverage by 1.15. 8. Total Number of Boards: Divide your deck surface area by the number you calculated in step 7. If you want to keep costs down and your home is level with the ground, you should install a ground-level deck. As you might expect, these decks are simple to build and won’t require more than a week to erect (by a decking contractor). To build such a deck, you’ll need deck boards as well as inner and outer joists, the pieces of wood that go between the top boards and your grass/concrete. The joists should measure as long as the length of your deck. Another very common deck is a raised deck with steps. Many homes are not built at ground level. Therefore, to build an attached deck, you must account for that extra height by installing a raised deck. Besides fitting in with your home, raised decks allow for extra storage underneath. Unfortunately, raised decks add more material and time to build. If installing, you’ll need all materials for a ground-level deck, plus boards for your stairs, the stair treads, joist hangers and joist support posts that raise the actual deck. The decks mentioned above assume you’re building an attached deck. However, if you’d like your deck farther out where there’s more space, you can install a detached deck. Think of detached decks like an island in your large kitchen. Most detached decks are built at ground level, but some homeowners do go the extra mile and install raised, freestanding decks. Of course, the latter will cost more. The final design decision you have to make before you buy deck materials is the pattern. Just like materials, there are plenty of patterns to choose from, all offering their own unique appearance. 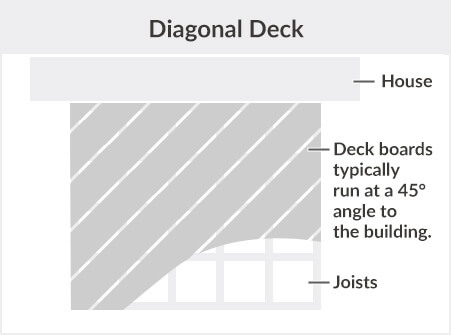 Also known as 90-degree angle decks, the horizontal pattern is the easiest design to install. Boards usually run parallel with the house. You can install a horizontal deck on the ground, raised or detached. If you want to keep costs down, install a horizontal deck. One step up in appearance is diagonal or 45-degree decks. Your top deck boards sit across the joists. Due to the design, diagonal decks are generally stronger than horizontal decks and can hold more weight. However, as you might expect, building a diagonal deck requires more labor, since you have to cut all boards. This of course raises your decking cost. Both deck designs look like a V and create a stunning deck design. Others think chevron patterns remind them of parquet floors. Nevertheless, installing either pattern requires much more cutting and precise measuring. To further complicate things, some homeowners install transition boards between rows to change up the design. Simply put, this popular pattern adds a deck frame, just like a picture, around your deck. Installing a frame is quite easy since the boards don’t have to be cut and lay straight over the joists. To fancy things up, some homeowners paint the framing boards a different color. 1. Permits: Some decks require permits from your city. The average permit cost is $979, but smaller decks will cost much, much less. 2. Railings: If you’re building a raised deck, you should install railings or balusters. While not listed in the calculator, this of course requires more lumber. 3. Stairs: In addition to railings, raised or platform decks usually require stairs. Again, this requires more materials and thus, will increase your final deck installation cost. 4. Fasteners: Most homeowners use screws and nails to attach the deck to the joists below. For a hidden design, you can install fasteners to do the same. Unlike screws, they allow for a smooth surface. 5. Painting: Did you know you could paint your deck? Try to DIY and save money if you want to add some color to your deck. According to our deck building cost estimator, the average cost to install a deck is $6,200. However, this price assumes you’re hiring a decking contractor. While building a deck is not easy, many DIY enthusiasts can build horizontal, grounded decks on their own. If you do, you could save thousands in the process. Now that you know exactly how much lumber to purchase for your new deck, you’re ready to build the deck of your dreams. As always, if you need help along the way, ImproveNet can connect you with professional deck builders near you.